What’s the easiest, next best thing to bacon if you’re short on time in the morning? Eggs cooked in bacon grease! I’ve come up with this very mathematical & scientific formula for detailing the wonderment and benefits derived from recycling bacon grease. Let’s get real here — you really can’t go wrong with bacon or any of its byproducts. Always, always, always save your bacon grease. A mason jar or Tupperware container will work just fine. Heck, if you want to do it old school, even a recycled tin can would work. Don’t waste the bacon grease! Spoon some bacon grease into your pan (or use leftover grease from bacon you’ve just cooked), enough to generously coat the bottom of the skillet/pan. Heat the pan over medium-low heat until the grease is fully liquid, even partly browned. 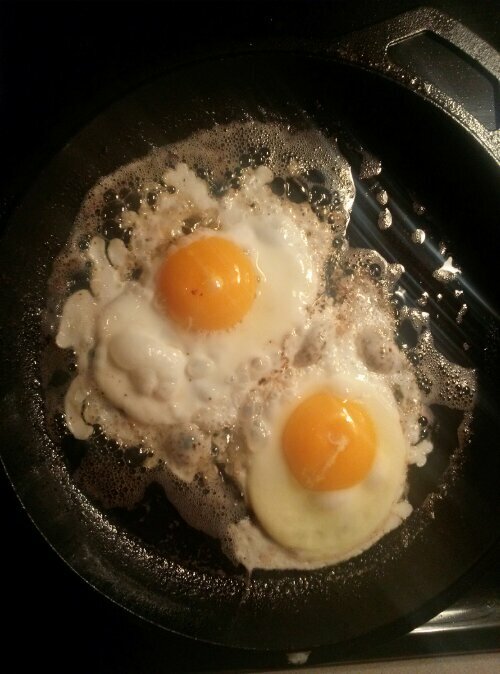 Let your eggs cook to desired consistency. Remove from pan in all their bacon grease glory. I completely agree with you about cooking with bacon grease. It adds such a nice flavor to almost any savory food.